All 24 members of the Audubon Commission must now be residents of New Orleans and appointed by the mayor under any circumstances, the New Orleans City Council decided this month — leading to the resignation of at least one member and growing calls for the commission to broaden its diversity by adding representation from more neighborhoods across the city. That requirement, however, was apparently lost at some point in the commission’s 140-year history, so Gisleson Palmer proposed restoring it, updating the archaic “citizens and property-tax payers” to the more modern standard of city residents. The Audubon Commission’s own handbook, she noted, also says the members must be 24 registered voters. The commission’s seats are filled by appointment of the mayor, but the updated language proposed by Gisleson also specifies that any unexpected vacancies on the board must also be filled by the mayor’s appointment, instead of allowing the Audubon Commission to do so in a practice known as a “self-perpetuating” board. At a question from Councilman Joe Giarrusso III, Gisleson Palmer said that the new requirements would be retroactive, applying to all current commission members as well as any appointed in the future. Giarrusso asked if that would require any of the current commissioners to step down, and Gisleson Palmer said it appeared so. The Audubon Commission said in a statement late Monday that one member would be leaving the commission, not because of the residency requirement, but because of he was appointed to fill a vacant seat by the Commission instead of the mayor. 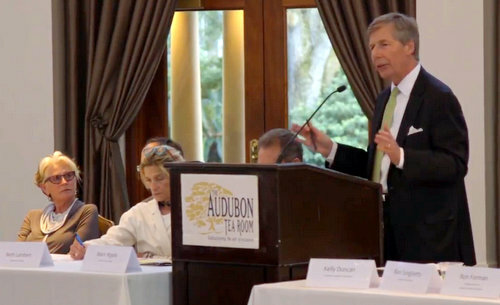 A broader issue — not included in the ordinance, but easy to address through future appointments — is the lack of geographic diversity on the Audubon Commission, Gisleson Palmer said. Her office identified 20 of the commissioners as living “above Canal Street,” with only one in Algiers, one in New Orleans East and one in Gentilly — even though the majority of the commission’s holdings are well outside of Uptown, such as the Aquarium and Insectarium, the new parks along the wharves, and the wildlife center on the Westbank. That issue drew the attention of two speakers at the Sept. 6 meeting of the full City Council, Meg Lousteau of the Vieux Carre property owners’ association and Allen Johnson of the Faubourg Marigny Improvement Association. Lousteau said she agreed that the commission needs representation from more neighborhoods, and hopes that Mayor LaToya Cantrell will consider that in her future appointments.